Fig. 7. Diagram of the technical architecture of the Sound Beehive. 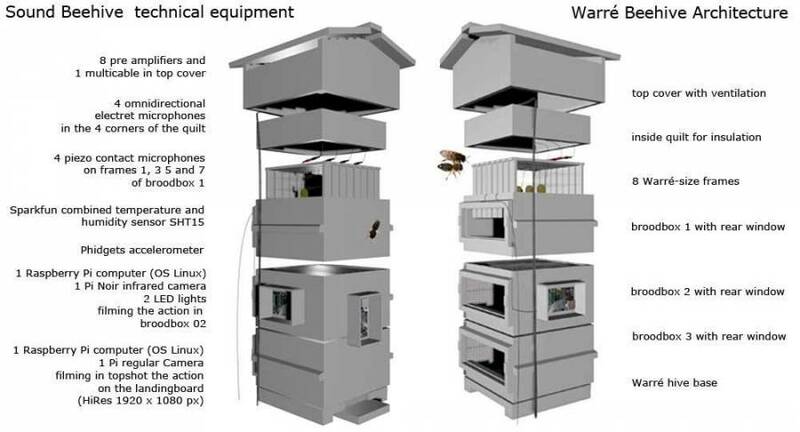 The following description of the Sound Beehive Experiment is based on the field notes that I made between early April 2014 and early April 2015. I am a media artist collaborating with computer scientists and engineers to develop art-science projects. Interested in showing the hidden structures in nature, I am using innovative technological methods to probe the living world. My preoccupations with bees come from a fascination with these amazing insects. Bees exhibit very original solutions on the level of communication and of collective decision-making. They are an endless source of visually stunning images and sounds and their remarkable collective behaviour provides inspiration and metaphors for the functioning of human society. Honeybees are bio-indicators. They provide a constant stream of information on the environment in which they forage, via their daily activity, and via the pollen and nectar they harvest. Diseases like colony collapse disorder and environmental problems such as the use of pesticides can be analysed in a different way by monitoring the colonies with audio and video tools, and by analysing their daily activity over several years. In nearly all industrialised nations, bee colonies are now threatened. There are many causes — among them pesticides and parasites — but the compromised state of the foraging areas for bees is just as worrisome. 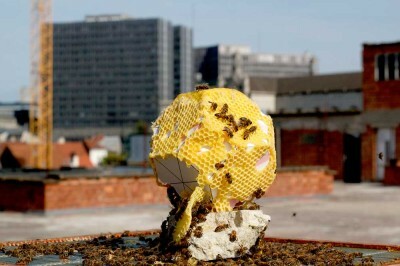 By using bees as bio-indicators and by translating the information into artworks, I make citizens aware of the increasingly negative effects of our lifestyle and methods of industrial production. We study the bees as a super-organism. To study them in their natural environment, we have built a customized ‘sound device’. 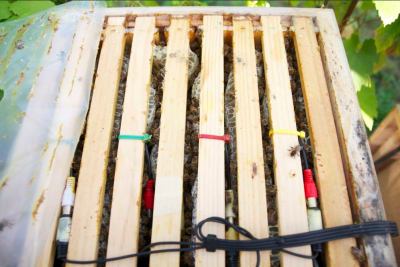 Microphones inside the beehive enable us to continuously monitor the colony’s buzz. Together with outside and inside video monitoring it forms a non-intrusive scanning device for controlling the colony’s health and development. 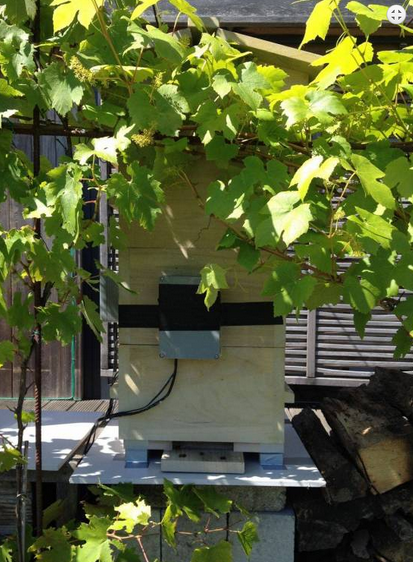 We also installed a network of temperature sensors spread throughout the beehive. Fig. 1. 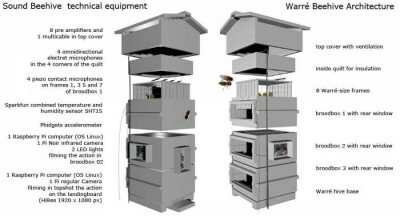 Instrumented beehives in the rooftop apiary. Left: the Sound Beehive. Aside from the biological study of the collective behaviour of the bees, the goal of the research is to make artworks, making use of the data collected from observing them. The annotated video and audio data are uploaded to our open source video database at pandora.okno.be. All corresponding sensor data from the weather station, as well as the temperature and humidity data measured inside the beehive, are made public on opensensordata.net. The bee colony operates through different communication systems such as pheromones and body language. Pheromones are chemical messengers released by the queen and by individual bees that strongly define the activity and behaviour of the colony. With our sound device, we look for information on specific situations such as alarm situations, stress situations, or on the amounts of brood in the nest. Bees are very sensitive to vibrations on the wax comb during the so-called waggle dance, one of their major means of communication inside the beehive. With the waggle dance, a successful forager bee communicates to the other worker bees in the beehive the exact distance and direction from the nest to the foraging field she has discovered. As the bees dance, they emit low-frequency sounds that play a critical role in bee communication. An accelerometer installed in the beehive measures the vibrations of the wax comb along three axes, inlcuding: audio, video and sensor toolboxes. Our custom-built audio, video and sensor device is based on the model of a Warré beehive, a sustainable beehive originally designed by Abbé Warré around 1920. It is a beehive in which the colony develops at its own pace moving slowly down into a new brooding box the moment they want to expand. This is contrary to commercial models of beehives that force the bees to build more combs by adding more so-called supers on top of the nest. We started to customize our Warré beehive by putting four electret microphones in the four corners of the top cover. Four Piezo contact microphones were attached with thin metal wires to the frames numbered 1, 3, 5 and 7 of the brood box. All microphones are connected to pre-amps stored in the rooftop. They are powered by a battery that is located a few meters away from the hive to avoid the creation of electro-magnetic fields. Fig. 2. A piezo microphone mounted on a frame. The bees build wax around it. Fig. 3. Piezos inserted between the frames 1, 3, 5 and 7. Fig. 4. Two electret microphones at the bottom of the (open) beehive. For recording the video images, we use Raspberry Pi computers. The Raspberry Pi is an ultra-low-cost, small Linux computer. The Raspberry can easily be integrated in complex installations and is equipped with a series of USB and Ethernet connections to function in a network of devices. We integrated two small high-resolution cameras in our setup. 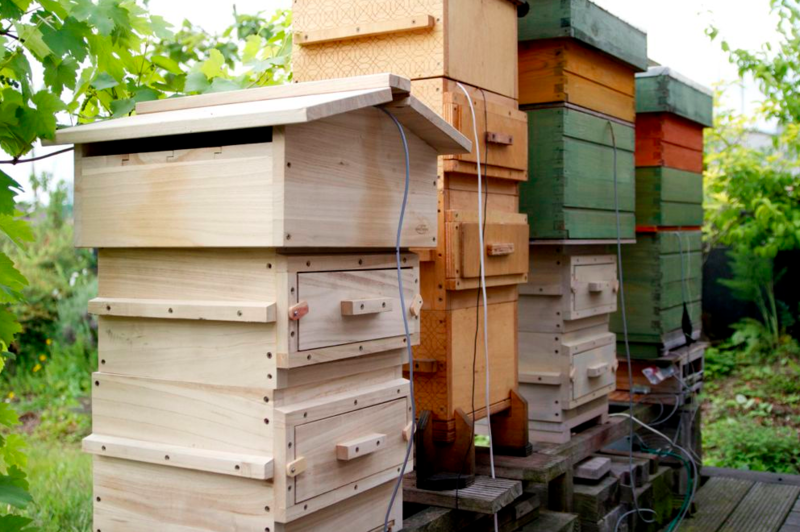 One camera is mounted at the outside of the beehive and frames a top shot of the landing platform. A second infrared camera with infrared LED lights is mounted at the side of the beehive. 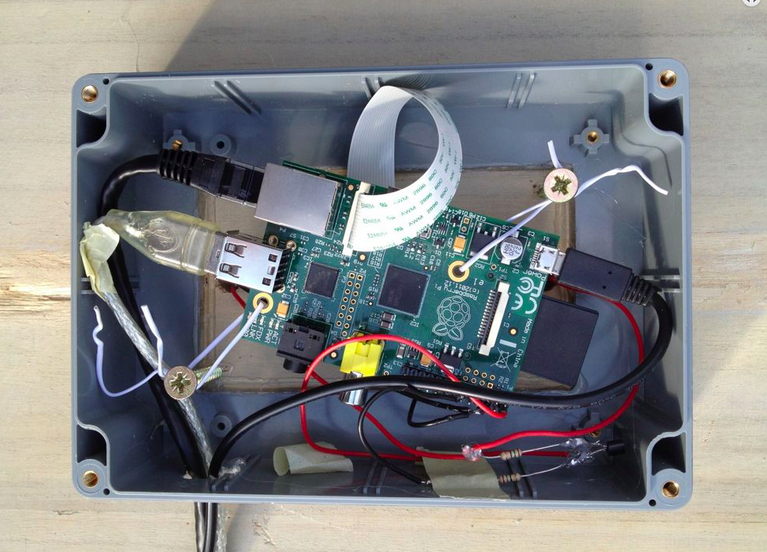 It records the activity inside the brooding box. An analysis of the images will give us information on the relation of the bees to the environment. We can count the bees in order to determine the in/out flux and detect homing problems related to pesticide contamination. The images also give us information about the pollen supply and the development of the colony related to the activity level of forager bees, fanning bees, dead bees and lazy bees on the landing platform. Fig. 5. Infrared camera, mounted on the inside of the brooding box. Fig. 6. Arduino with connected temperature sensors, Raspberry computer connected to the IR camera. This box is mounted outside of the brooding box. Beginning in the middle of August, 2014, we added a real time audio/video streaming set up. We connected two more microphones at the entrance of the hive to record the taking off of the forager bees, and to record the ventilation processes of the guard bees. All outside activity is filmed from sunup to sunset. Fig. 8. Streaming facilities with the Raspberry camera and computer. A bee colony is very responsive to the biotopes of which it is a part. The production of honey is dependent on the flowers we grow, the plants we like, and the garbage or pollution we produce. The colony is also very sensitive to environmental variables such as outside temperature, rainfall and humidity, the wind and hours of sunshine. We therefore compare the behaviour of the bees and the development of the colony with the data from the weather station. In our rooftop field lab, we have installed a Libellium agriculture kit, including several environmental sensing devices, e.g., an air temperature sensor, an air humidity sensor, a soil temperature sensor and a solar radiation sensor, among others. We can determine the degree of air pollution by analysing the number of dust particles on dead honeybees. We also observe the hours of solar activity related to nectar flow of the flowers and the visits by the bees. Nectar secretion increases as pollinators visit the flower. Soil composition might also be important for the nectar flow of the flowers. We set up a database of the pollen contained in the honey of our urban bee colonies and we try to determine the pollen source. By studying the pollen in a sample of honey, it is possible to collect evidence of the geographical location and genus of the plants that the honeybees visited. As such, we can start to trace green corridors through the city, helping the bees to extend their foraging fields. Beginning in January 2015, we started analysing the recorded files. We first worked with the frequency and the amplitude of the sound files. We analysed the files in terms of their brightness, loudness and noise level. For the analysis of the video files, we made use of motion detection via the frame difference method. The analysis of the sound files is a complex matter. We therefore use techniques of Artificial Intelligence (AI) in collaboration with the Brussels Free University. We have recorded large amounts of data in order to investigate whether we can detect patterns that help us to both monitor the environment as well as the bee colony’s health. The challenge is that there is a large amount of real-world noisy data in which the patterns may not be stable over time, as bee behaviour changes with the seasons. All together these data give us plenty of parameters to combine and to play with, to create models and to compare different moments in time and thus to study the behaviour of the colony relative to timeline/season and environmental parameters. Fig. 9. Motion tracking analysis of the video images. 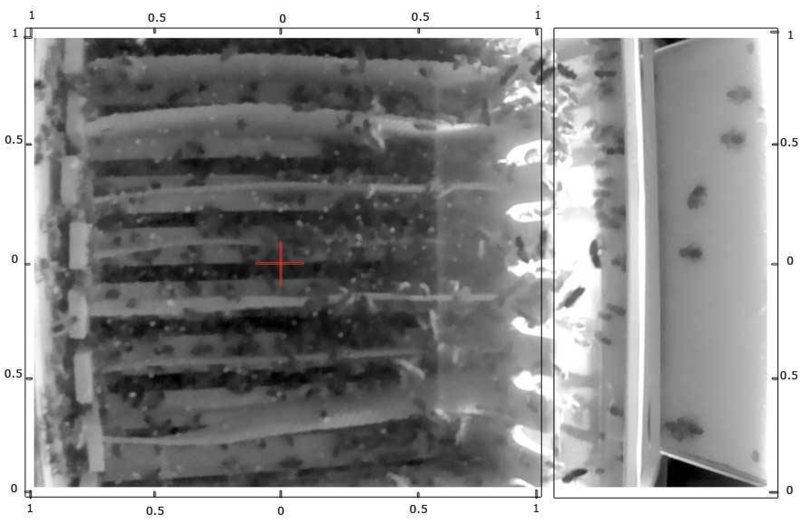 A video shows a graphical rendering of AI analysis of colony behaviour combining real audio data with measurements of the microclimate inside the hive: temperature, CO2 and humidity, using machine learning to detect patterns in the data. Another video shows 365 days of activity inside a real observation beehive, played back at high speed. 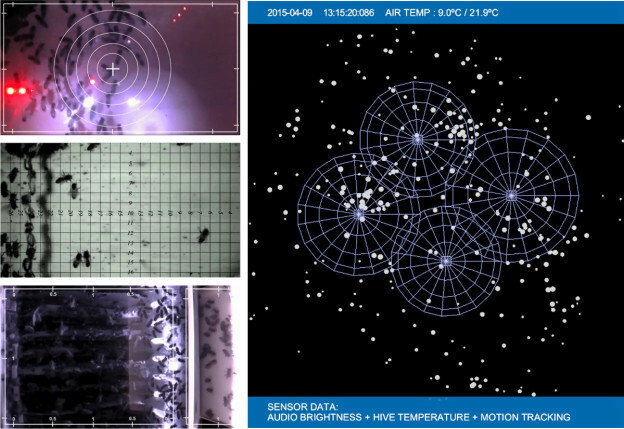 The images were recorded with an infrared camera inside the hive and processed using pattern recognition, AI and computer graphics algorithms. These images offer the stunning visual experience of a bee colony in action. Fig. 10. The Scaffolded Sound Beehive, an immersive installation. 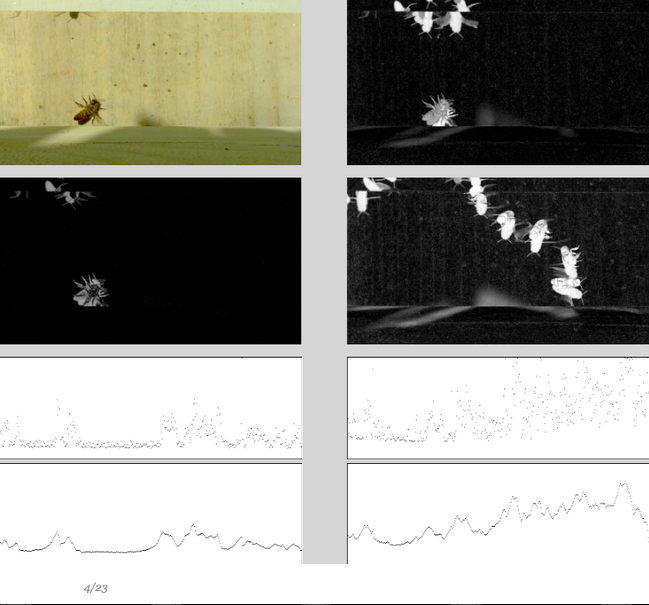 To create an immersive sound installation — The Scaffolded Sound Beehive — we analysed the sound files recorded in the hive. We processed the recordings using sophisticated pattern recognition algorithms and artificial intelligence analysis software, and edited the sound files from several months down into a 15-minute sound piece by adding swirling electronic sound clusters to sonify the ebb and flow of swarm activity in the hive. 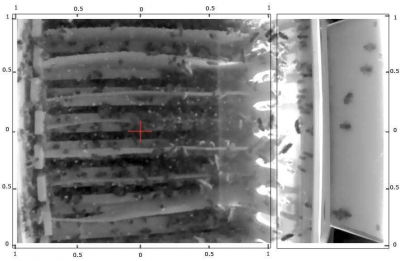 For the composition, different ideas around swarm formation were investigated. The increase and decrease of the activity in the hive became a guiding princple for the transformation of the recordings. Natural phenomena were used as musical tools and in retrospect, musical tools were used as an artistic rendition or analysis of natural phenomena. The Scaffolded Sound Beehive was printed at fablab BrusselXL using open source digital fabrication and is mounted on scaffolds that are 2.5 m high. Visitors can put their head into the top and experience an auditory artistic interpretation of hive activity, making this an interactive immersive installation. It will be shown at the Institute of Evolutionary Biology (IBE) in Barcelona (May-June 2015), and will later travel to the exhibition AI and Art for the international conference of Artificial Intelligence in Buenos Aires, Argentina (July 2015). AnneMarie Maes works on the interwoven threads of multi-media installations, ecological issues, and social and anthropological projects. Her current work focuses on the ongoing Bee Monitoring project which sets up laboratories for bee colonies and urban gardening. She is a founding member of the organizations So-oN and OKNO and holds masters in fine art and cultural studies. BUBL is an independent international collective of artists, scientists, beekeepers, technicians and creative people. 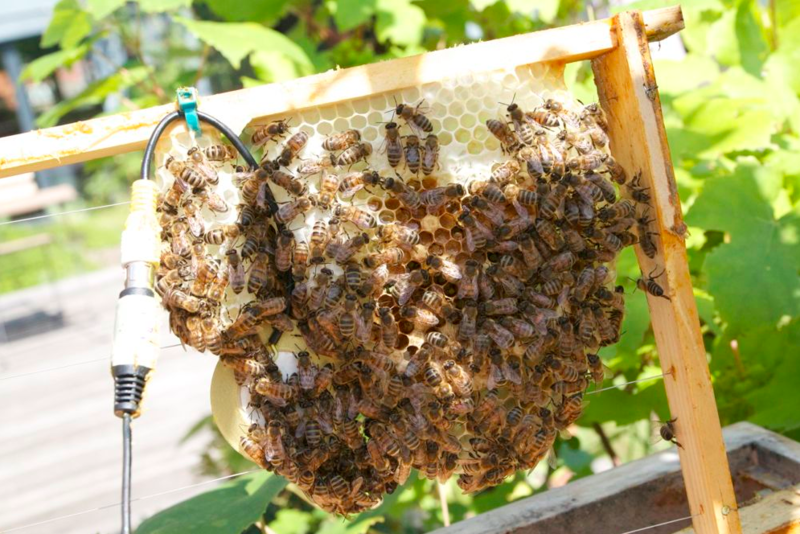 It uses artistic, scientific and technological research to tackle challenges related to sustainability and the monitoring and survival of city honeybees. An extensive rooftop garden in the centre of Brussels hosts the headquarters of the BUBL laboratory. It houses several experimental beehives and instrumentation equipment. From this laboratory, data are continually being broadcast via streaming technology. The installations developed by BUBL explore highly experimental technologies, such as microbial fuel cells, digital and organic fabrication using OpenStructures, bio-mimicry, spatialised sonification, web-based continuous data streaming, data mining based on Artificial Intelligence, organic electronics, solar energy for powering low-energy computing, etc. 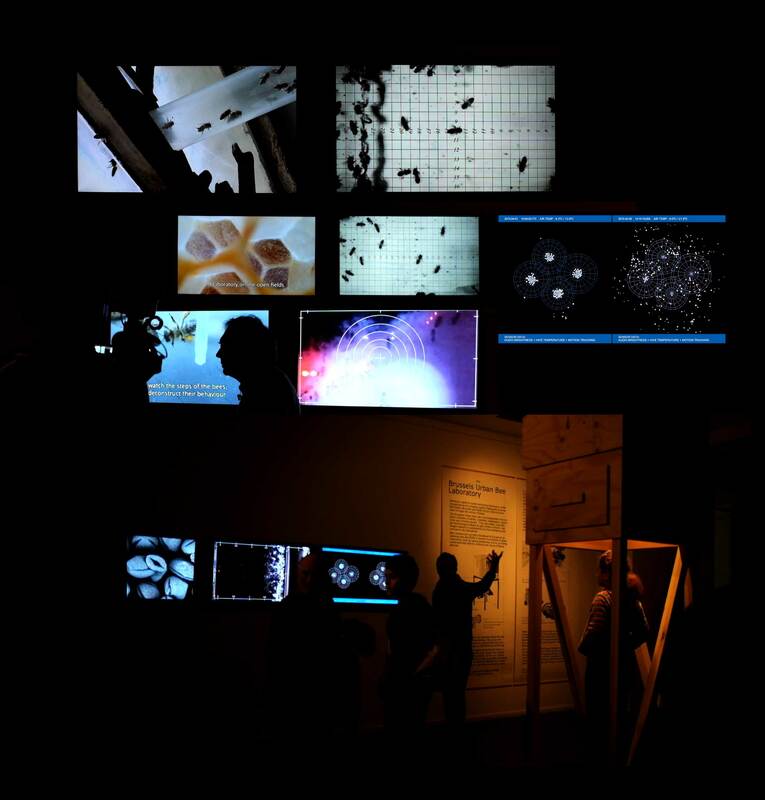 Our lab collaborates with several universities and a network of artistic research centres throughout Europe.